CenTrak Security Solutions utilizes easy-to-use software applications that enable clinical staff to spend less time managing a security system and more time focusing on what matters most – caring for their patient. Healthcare facilities want their patients and residents to be 100% secure, yet no one wants a person to feel locked away and unable to walk around, socialize and have a change of scenery. Technology that includes hospital patient-tracking systems, tracking for assisted-living communities and wander management security systems have features that enable patients and residents to have a better quality of life, give families and staff peace of mind, and allow operations to flow more smoothly. CenTrak offers an advanced security solution: A Clinical-Grade Real-Time Location System (RTLS), powered by active-RFID technology that captures the exact location of people and assets, combined with a comprehensive safety and security platform. CenTrak’s Enterprise Location Services offering™ utilizes up to five technologies including 900 MHz, Wi-Fi, CenTrak’s patented Second Generation Infrared (Gen2IR), Low Frequency RF and Bluetooth low energy (BLE), to give the location of the badges and tags in any areas where sensors are placed. Once the sensors and tags are in place and the system is deployed, users can see exactly where any tagged person or object is located. If someone or something goes astray, system users receive an alert and can quickly respond. This is particularly useful when dealing with a wandering patient or resident; if he or she begins to roam outside of the appropriate boundaries, a caretaker can politely and discreetly redirect them. Accuracy: The system gives accurate, precise locations. Speed: The technology performs in real-time with no latency issues. Monitoring: The devices can track and check the status of medications, samples and equipment as well as people. Protection: Compatible with existing security and access programs. Integration: The technology integrates seamlessly across multiple platforms. Dependability: Tags and devices have an easy-to-change, long-lasting battery. While traditional hospital patient tracking systems captures an estimated-location area, CenTrak’s patient safety platform integrated with real-time location technology shows where employees, patients and equipment are precisely located “right now”. Users define areas within the facility where the technology is needed which usually includes patient rooms, hallways, common areas, nurses’ stations, cafeterias, lounges, exits and other relevant spaces. Freedom to interact with others — Even the most unstable patients can still get the support they need, and visit certain hospital areas for social interaction. Ability to use facility’s resources without a sense of “lock-down” — While security is essential in a hospital setting, patients don’t want to feel restricted. CenTrak’s platform can help facilities empower patients with a feeling of control and freedom while ensuring their safety and security. Protection from wandering into dangerous areas — Keeping patients out of key areas is not just critical to the safety of staff, but also to the safety of the patients themselves. CenTrak offers hospitals the ability to set zones that are unsafe for patients. If a patient wanders too closely to a restricted zone, staff members are immediately notified to politely redirect them. Effective wandering-patient prevention systems such as CenTrak Security Solutions can save lives, money, anxiety and possibly even grief. These reasons alone drive more advanced technology for patient safety and security, including virtual eyes on what is happening and digital alerts that enable an immediate response if someone wanders. Adjust rules and access at the individual level — Some patients may not present any risk and should have greater access to facility amenities, such as lobbies and cafeterias. Others may be better protected by limiting their movement throughout the facility. With CenTrak, hospitals can determine each individual case and adjust the system accordingly to meet their unique needs. Customize by severity (high-risk vs. low-risk residents or patients) — In addition to setting the rules by individual patient, hospitals can program the system for patient classes; high-risk patients can have different settings and permissions than low-risk ones. 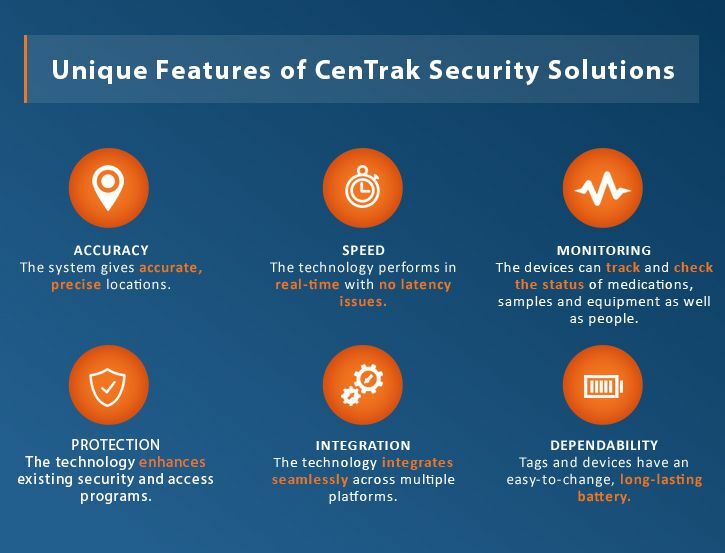 Integrate CenTrak Security with existing RTLS for simplicity — Instead of having to upgrade or replace your current real-time location system (RTLS), this solution suite integrates into it. Having one universal system not only saves hospitals money, but it also means minimal maintenance costs. The real-time visibility technology of CenTrak not only enhances patient/resident safety and security, it will identify any inefficient points or components within the operational functions. Using the system-gathered analytics, a department can streamline the workflow, plan high-value medical equipment inventory numbers more precisely and frequently identify savings opportunities along the way. CenTrak optimizes the technology as one that can serve nearly any department or entity as a tool to improve the patient experience, create the safest environment possible and boost efficiency. Sanctuary Care at Rye™, a 56-bed assisted living community focusing on residents with mild to moderate cognitive impairments and memory loss implemented the CenTrak system and a case study of the implementation reveals that most importantly, feedback from residents and their families was positive. Among the capabilities the system enables, family members can get real-time visibility of their loved ones’ location anytime and in some situations, can receive photos or videos as well. Along with the residents’ and families’ positive experiences, Sanctuary Care team members realized the benefit of being able to locate each other at a moment’s notice. A staff-alert feature on the system enables them to locate a specific caregiver quickly when needs arise among the community. Sanctuary Care achieved capacity within six months, which was 30% faster than expected. The system improved caregiver response time, increased operational flow and enabled visibility that allows residents to move around freely yet safely. Staff members found that they waste a lot less time on searches around the community and are able to interact with residents more frequently. Discover how other senior care communities have benefited from CenTrak’s resident security technology. CenTrak’s range of Enterprise Location Services help ensure that staff, patients, residents and visitors are safe and secure, which naturally augments other facets of care and operations. Most obviously, people enjoy additional freedoms a lot more than they do restrictions, so a system that allows more liberty equates to better care and perhaps a better quality of life for some of society’s most vulnerable people. When staff members feel more confident about maintaining safety and security, they can spend more time enhancing the care experience. To talk, pause, laugh and interact with patients and residents are valued parts of care that many nurses and caretakers simply do not have time to deliver. The greater the operational efficiency a facility can achieve, the more care providers can focus on the patient or resident experience. Generally, staff members have a more positive attitude when they feel as though they are contributing to the organization’s true mission and core purpose, as opposed to possibly wasting time compensating for operational inefficiency. Hospitals and assisted-living communities have plenty of real crises, and the CenTrak wander management system can be one tool for reducing everyone’s stress level while simultaneously improving care and achieving better efficiency. Superior safety and security results from the real-time system that gives immediate alerts. Avoid potential tragedy and family grief. Improved sense of freedom since safe areas can be designated for patients or residents. Coordinated care creates patient/resident satisfaction as well as a better overall perception. Peace-of-mind awaits the loved ones, as they feel confident, or at least less anxious, about safety. Dignity must be a part of any caretaker’s considerations – the platform tracks with a tiny tag that can be placed unobtrusively and worn comfortably. Privacy should go without saying, but unlike video and some other kinds of surveillance, CenTrak gives real-time information and graphically differentiates among assets without showing actual images. A CenTrak Security system can address the majority of concerns about patient safety. Its users, from patients and their families to all levels of medical staff and administration, discover multi-faceted benefits of the system beyond improved safety and an enhanced patient experience. CenTrak’s approach helps healthcare providers preserve the all-important safety and freedom of their patients and residents. The same system that helps ensure patient/resident safety and security from wandering and elopement situations has applications that improve the quality of care, operational flow and logistical efficiency, and help save money in the process. Protect your most precious assets with the ultimate security and location platform. Each infant is protected by wearing a small, comfortable, and unobtrusive tag which actively communicates with the system and allows your staff bed-level location visibility. Workstations display floor plans of the facility, showing monitored areas and protected exits. Should an unauthorized attempt to leave the monitored area with a protected infant occur, the CenTrak system will immediately set off an alarm, capture video image, activate door locks, and even hold selected elevators. CenTrak’s platform enables facilities to ensure mothers and families peace of mind that their baby is protected and always properly matched with mom. Ensure facility safety with the ultimate security and location platform. Empower residents with a feeling of control and freedom while ensuring their safety and security. Residents can pass through designated access points (e.g. to reach a common area), while others remain secured and protected within different areas. Patients can reach communal space, while remaining secured and protected from wandering to restricted spaces. CenTrak’s versatile platform provides clinical-grade safety and security for patients of all ages. One infrastructure to install and manage for room-level locating, wander management and access control. To learn more, download our Long-Term Care Resident Security and Acute Care Wander Management solution sheets.